Brighten your mood. Lift your spirits and boost positivity no matter what's got you down. Happiness in a bottle. Lower social inhibitions without the sloppiness of alcohol. Quiet your mind and be in the moment. Enjoy talking and connecting with others. Add a gear that gets things going. 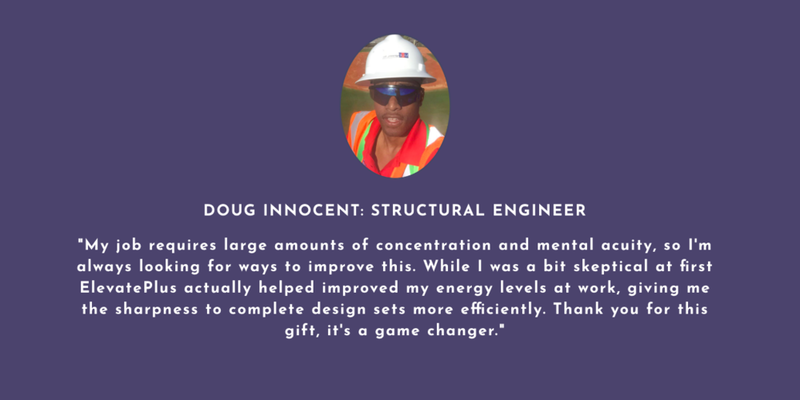 Increase your confidence and energy levels. Tackle your problems with a sharper mindset. We live in our heads. Always worried about the future and thinking about the past. We don't enjoy the present moment. This makes us overthink social interactions and feel anxious. Leaving our conversations and social-life void. 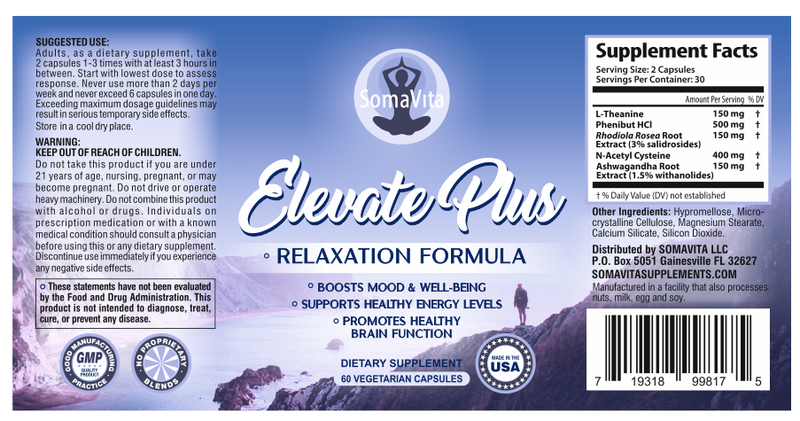 ElevatePlus is made with the finest brain-boosting compounds and natural herbs to enhance well-being, mood, and social interaction. Live and enjoy the present moment. Give yourself the confidence that has been dormant inside by lowering social inhibitions and stress. P.S. Unlike most companies, we do not use proprietary blends. This means we tell you the exact amounts of each ingredient. So you don’t have to worry about not getting your money’s worth. No tricks, just good old fashioned supplements that work. We believe in our products. This is why we give complete transparency. We choose only the highest quality ingredients. Many companies use misleading proprietary blends so they can undercut the ingredient amounts. Our ingredients are fully dosed based on clinical trials. Do not exceed 3 servings/day and do not use more than 2-days per week. Follow the suggested use visible on the label. Intended for adults 21+ years of age. Let's take a look at what makes ElevatePlus so powerful. Amounts listed are per each serving. A compound used in Russia since the 1960’s to support stress levels, feelings of well-being, and sociability. It works by binding to the GABA receptors in your brain. The GABA neurotransmitter plays a role in mood. *Phenibut is a powerful compound. As such, tolerance can build up quickly, which may result in unwanted side effects. This is why it is vital to follow dosing instruction and ElevatePlus should NOT be taken everyday. An amino acid from the tea plant (Camellia sinensis). It boosts mood and improves mental performance. L-theanine is often taken with caffeine for relaxation without drowsiness. Also known as Indian Ginseng, a plant used in traditional Ayurveda medicine to give vitality, neuroprotection, and anxiety relief. It reduces the level of stress hormone, cortisol. A traditional Chinese and Scandinavian herb used to invigorate the body and mind. It is taken as an adaptogen (stress-reliever) and a fatigue remedy. A powerful antioxidant known for its neuroprotective and anti-inflammatory effects. By restoring levels of glutathione in the body, NAC helps the brain deal with oxidative stress. Feel free to write your review or comment here.